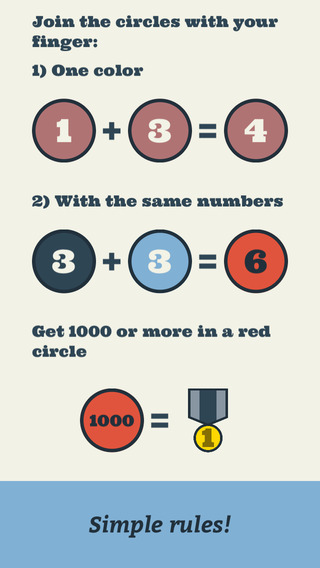 Vladimir Golovnev has produced a terrific point scoring puzzle app game called Numbermania - Join the Numbers. This game is NOTHING like 2048. Look at the first diagram. See the 1 + 3 = 4? That will score you zero points. See the 3 + 3 = 6? That will score you 6 points because the colors were different. Each time you Join the Numbers, a new number/color will fill the grid. The random number can only be 1-4. There will be times when you must connect brown numbers to each other. Eventually, you will need to combine them with an identical number. I've played this game about 20 times. I had 1 marathon game that didn't seem to end. At one point I had a blue 73 and somehow managed to create a green 73 right next to it. The graphics will not dazzle you. But that's okay. The brilliance of this game comes down to this: what strategy will you employ to stay alive as long as possible. Yes there's an element of luck. But with very careful planning, can you stay alive forever? According to the Game Center, there are 1,137 players. The high scorer is DivODA with 36,912. Next is ~ Aas1962 ~ with 27,302. I'm at #3 with 22,696 points. That one game took about 4 hours.